WASHINGTON, June 13, 2018 /PRNewswire/ — New Orb Media Inc. reporting and data analysis shows a strong connection between how we view old age, how well we age and the effects seen across world cultures. Individuals with a positive attitude towards old age are likely to live longer and in better health than those with a negative attitude. And those with a negative view of aging are more likely to suffer a heart attack, a stroke or die several years sooner. 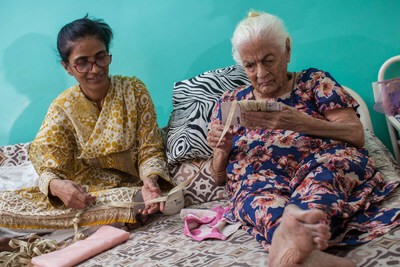 Older people in countries with low levels of respect for the elderly are at risk for worse mental and physical health and higher levels of relative poverty. Orb Media compiled data from 150,000 people in 101 countries to learn about their levels of respect for older people. The data show the level of respect varies significantly from country to country. Healthy aging is increasingly important: Outside of Africa, countries everywhere are aging rapidly. If population trends continue, by 2050 nearly one out of six people in the world will be over 65, and close to half a billion will be older than 80. Orb Media is pleased to partner with members of the Orb Media Network (OMN), a group of global agenda-setting media which collaborate to simultaneously publish stories together that catalyze global dialogue on critical issues, focusing the attention of government, industry, researchers, civil society, and the public. OMN members include SVT (Sweden), Die Zeit (Germany), The Hindu (India), Folha de São Paulo (Brazil), Tempo Media Group (Indonesia), El Tiempo (Columbia), BBC (United Kingdom), Cadena SER-Prisa (Spain), CBC (Canada), Dhaka Tribune (Bangladesh), Deutsche Welle (Germany), and YLE (Finland). Orb Media is a nonprofit journalism organization that reports on issues that matter to billions of people around the globe. We publish our work simultaneously with a global network of leading media organizations to catalyze global public dialogue to generate citizen-driven change. Fusing original research, data analysis, on-the-ground reporting, and an engaged public, Orb Media produces agenda-setting stories about the challenges we face together as one world. Orbmedia.org/agewell. Media Contact: Lara Kline, larak@orbmedia.org.